Oh no, not another chocolate and peanut butter post! Yes, yes, it is. I’m sorry to my readers who are so sick of hearing me continue on about peanut butter and chocolate! 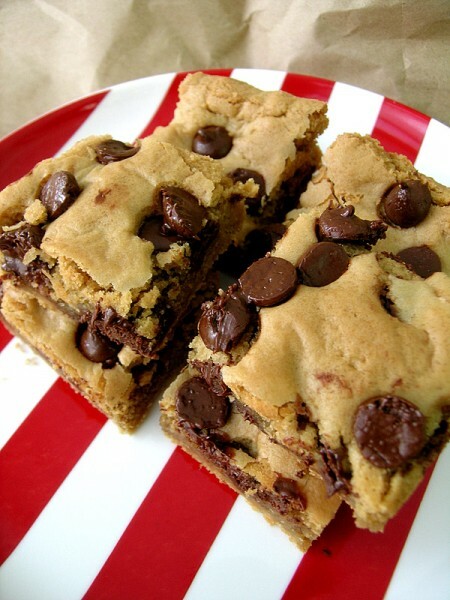 I just can’t get enough of this flavor combination though and when I searched for a recipe for peanut butter blondies I came across one that had chocolate chips in it and within minutes I was sitting out all the ingredients to put these blondies together. Oh, how delicious these were! And I was pleasantly surprised to discover that they tasted nice with coffee. If you want to make these too, please do so immediately! They are so quick to make and you’ll be rewarded with the delicious taste of gooey peanut butter and gooey chocolate in no time. My only change to the original recipe was to divide everything in half and place the batter into an 8×8″ square pan. I recommend eating these by the second day after you make them, because they seemed to dry out and harden after the second day, even though I had them covered tightly. It shouldn’t be a problem to eat them quickly, however! 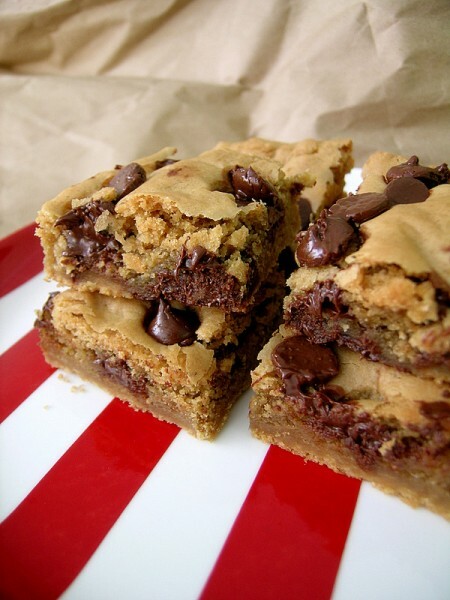 One of the most popular recipes on my blog, these peanut butter chocolate chip blondies are sure to satisfy! This sounds good! But is it really either MILK or CHOCOLATE? Not both? Ashley, I’m not certain of this, but I don’t see why they wouldn’t freeze well. I think some flavour combinations are unbeatable, including chocolate and peanut, so you’re excused for coming back to them! These look gorgeous, thanks very much. I just took a pan of pb blondies with chocolate chips out of the oven. LOL Great minds, eh? I just threw a batch of these in the oven! Based on how the batter tasted, I have a feeling this will be our new favourite recipe! YUMMY! I made these last month and finally got the post up on my blog! I LOVE PB and chocolate too- just can’t get enough. I just made these tonight and the batter turned out to be crumbly instead of “battery” lol. I wonder what I did wrong? The only thing I could think of was that I didn’t let the peanut butter mixture cool COMPLETELY before I added it to the flour mixture? They still tasted great! Just too crumbly! I just made these and am a little disappointed… they turned out kind of bland and really aren’t anything to write home about. Hope everyone else who tries has better luck. The directions are confusing. You say, “Add the egg and mix well”, but what am I adding it to? The peanut butter mixture or the dry mixture? These are AMAZING!! I even halfed your half-recipe since I’m a single gal with no self control 😉 and they were perfect!! This one’s definitely a keeper! Thanks!! I can never have enough PB and chocolate. I just LOVE the combination and these blondies look fantastic!! I can’t wait to give them and try! Is the batter supposed to be hard and super thick? My was so thick i had to press it in the pan like dough. They’ll be out in 20 minutes though, so I guess I’ll see if the taste is fine. The batter is quite thick and you will have to sort of spread and press it into the pan. I hope they’ve turned out well; let me know! My batter was more like cookie batter. Not very smooth. They smell wonderful though. Hi there! I was going to make these for my boyfriends birthday and wanted to know what peanut butter you suggest to use? Also, is the recipe above for an 8×8 pyrex dish? I saw something about halving the recipe and just wanted to be sure! Thanks!! Just made these. AMAZING! My husband and I loved them!! Thanks for sharing. Just to be clear – if I was going to make this recipe in a 13×9 baking pan, I would just double the ingredients?? Just made these and turned out pretty good! Next time I would add a bit more PB (and in return add a bit more butter) as I want the PB taste to come through a bit more. I did 20 minutes for an 8×8 pan and they came out the gooey texture 🙂 thanks for the recipe! These look great. I am the congo bar expert. I’ll have to make these with the peanut butter. My mixture came out very crumbly as well could it be I heated the sugar and butter too long?? I made these 2 x’s now and the first time they were great, the next very crumbly and not brownie like at all. I know the problem was the butter/sugar mixture. The first time I let it cook until just melty and smooth, the next time i cooked it a bit longer because I was multitasking. I knew once it cooled the second time that it was wrong because it got hard and didn’t stay runny. So if you decide to make these only cook the butter/sugar mixture until just smooth, the sugar wont dissolve but it’ll look pourable. I must also be missing something. Made these last night, not good. Dough was super thick, had to press into pan. They came out floury and super hard. Not much of a peanut butter taste at all. Seems half stick (4tbs) of butter might not be enough. Sugar mixture needed more “wet”. Should it be 1/2 cup butter and not 1/2 stick? Mine turned out completely dry and crumbly? To everyone having trouble, I’m not sure what you’re doing wrong. The butter is absolutely the correct amount. 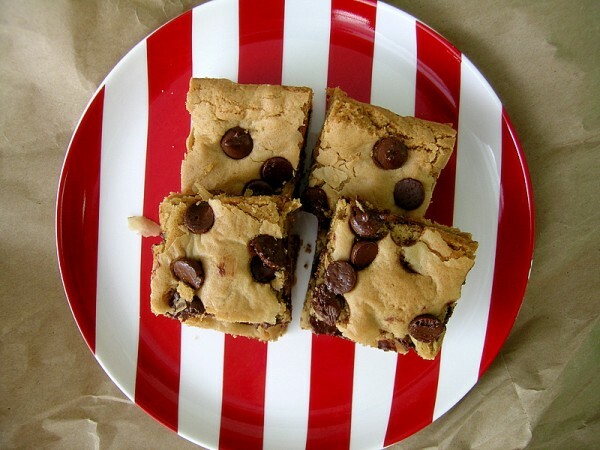 I have made this recipe a couple of times without problems, and even did another post on them here – http://www.sweetestkitchen.com/2012/11/peanut-butter-chocolate-chip-blondies-2/ – because this recipe has been the most popular one on my blog for weeks. I halved the original recipe (see link in recipe above), using exactly half of each ingredient. All I can suggest is to be sure to measure the flour correctly (use a spoon to pour the flour into the measuring cup, tap the measuring cup lightly a couple of times, then level the flour off with a knife or similar). Only heat the butter/sugar mixture until the sugar has melted and the mixture is smooth. Be sure to let the mixture cool to room temperature; if you don’t, it might be too hot when it goes in the oven which means the blondies will be over-baked. One of the most important things is not to over-bake the blondies – if you do, you will end up with dry blondies, which is not a good thing. Use an oven thermometer to check your oven is not too hot. If you are unsure, take the blondies out of the oven earlier than the recommended time as it’s better to be under-baked than over-baked. Blondies are supposed to be gooey anyway! I’m sorry to everyone who’s had trouble. Check out the original recipe (again, see the link in the recipe above) and make a full batch if you prefer. I hope, if you decide to try again, you’ll have better luck. Try putting a slice of white bread in the container. It helps keep them moist. When you say 1/2 stick of butter. How much would that be in a cup? the only unsalted butter I was able to find was a large block that would probably be 2 cups worth. Hi Debbie, 1/2 stick of butter is 1/4 cup, or 4 tablespoons. Love this recipe! I upped the peanut butter to 1/3 cup (instead of 1/4 cup) because I wasn’t getting much peanut butter flavor the first time. I also added 1tbsp of applesauce to the mix right before i added the chocolate chips. 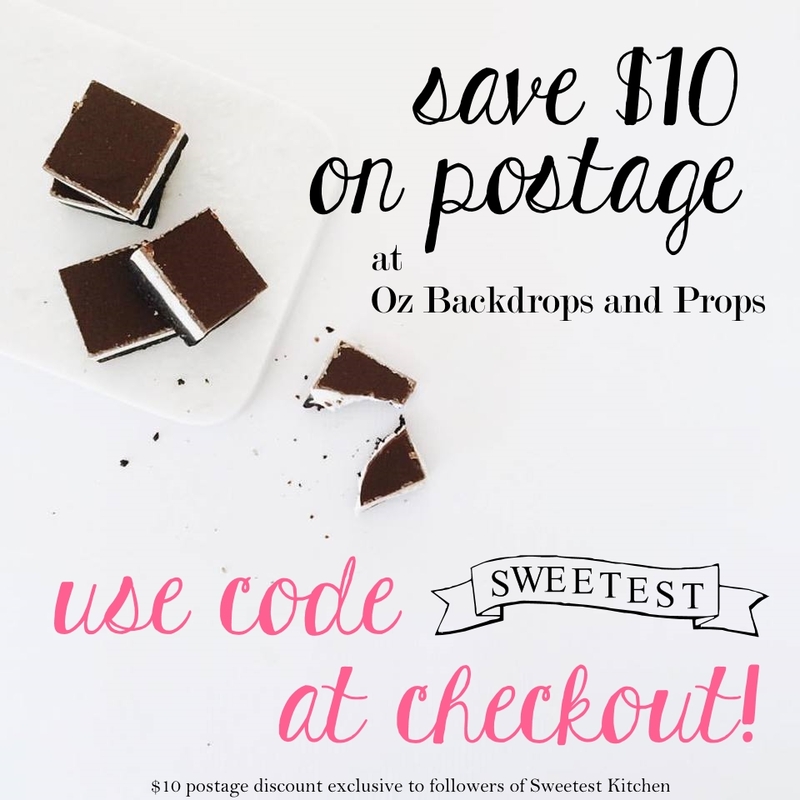 Does nothing to the flavor of the bars but helps keep them moist and gooey longer! Can you replace all purpose flour with whole wheat flour?? These look really good but I want to make sure before I make them! How would you divide everything In half? Half an egg doesn’t really make since? I think the original recipe (linked to in the post above) called for 2 eggs, so I simply omitted 1 egg, which is why there is 1 egg in the recipe I wrote in my post. You don’t have to worry about using half of an egg. I just made these, and they came out amazing. I didn’t melt the sugar/butter mixture for too long, just until it was blended together nicely, and then I made sure to wait until it was completely room temperature. Also, I really worked the dough and then pressed it out into the 8×8 pan by hand. It came out wonderfully after about 21-22 minutes. Thanks for a wonderful snack break during finals week! Made these today after reading through all the previous comments & taking advice/recipe adjustments from others and they turned out PERFECT! Delicious. ADDED 1tbsp of milk & upped the PB from 1/4c to 1/3c. They could even have a little bit MORE chocolate chips…no such thing as too much chocolate. The adjustments made to the recipe made the batter fairly easy to spread. I had no problems. Best fresh out of the oven (warm) with a scoop of vanilla ice cream…YUM! Hi, I’m 12 and I wanted to make these while my mother and father are at work, Is there any way I don’t have to use baking powder? I searched for it and I couldn’t find any! And the recipe looks great! In a baking mood! Definitely going to try these! What’s baking powder? And what brand? I’m confused. All purpose flour, baking powder, and baking soda? What’s the difference between baking soda and baking powder? Pretty good. I used almond butter in lieu of PB. A bit dry. Prob would have baked for 22 min next time. Very easy recipe. My brownies turned out really dry and crumbly (sp?). Did I miss something? I have an obsession with all things peanut butter; and when combined with chocolate, it’s just short of Heaven! I have a chocolate chip cookie recipe that I use for both regular drop cookies and when I get lazy, bar cookies. I have never tried to add peanut butter to them. Now, I won’t have to do that! Thanks for posting this…can’t wait to try it! I don’t make blondies often (or, for that matter, I think I’ve made them only once), but these just might set me on a blondie-making-craze! I’m not sure where I went wrong on this recipe. After mixing the dry and wet ingredients I got a batter that was chunky dough like to make cookies. I was expecting almost a liquid to pour into the baking dish? Hi Bridgette, I haven’t made these for a while so I can’t quite remember, but I’m pretty sure you’ve done nothing wrong. The dough is very similar to the texture and consistency of cookie dough; it is definitely not like cake or muffin batter. You’ll have to spread the batter evenly around the pan with a palette knife (or the back of a large spoon, or your fingers! ).